I started talking with Enrique in 2001. I was collecting parts to restore my series one. Enrique sent me a message telling me if I needed any help with the body work look him up. I did get with him and Bean Dip over the next couple of years. We traded parts and experience about early Z cars. Made the two hour trip down to see him several times. It was always worth the drive. Traded pictures of the rust repair on my car. One Friday Enrique and Bean dip drove up to check on the body work and Enrique sprayed the primer in the engine bay of my car. Like Arne I am just far enough away that getting together as often as we like was hard to do. Always looked forward to the Canby shows and the procession of Z cars in to the fairgrounds. I will truly miss our gatherings and friend ship. No return spring boss on clutch slave -- OK? a7dz replied to BoldUlysses's topic in Help Me !! I have been running my 70 with out the spring for five years now with out a problem. Sounds like it was contaminated some how. It took me three days to do my tank. It looked like glass inside. I poured the excess fluid out through the hole for the sending unit. There was some extra in the tank that I rotated to the top. I did not want to seal the drain plug permanently into place. Added a few more miles in the sun. Count me out this year. It is graduation week end here. Wheel well Frame Repair One of the common rust areas on the 240Z is in the front wheel wells just aft of the torsion rod fitting on the frame. There is a doubler / stiffener spot welded to the inner wheel well that traps water between the two pieces of metal and rusts from the inside out. 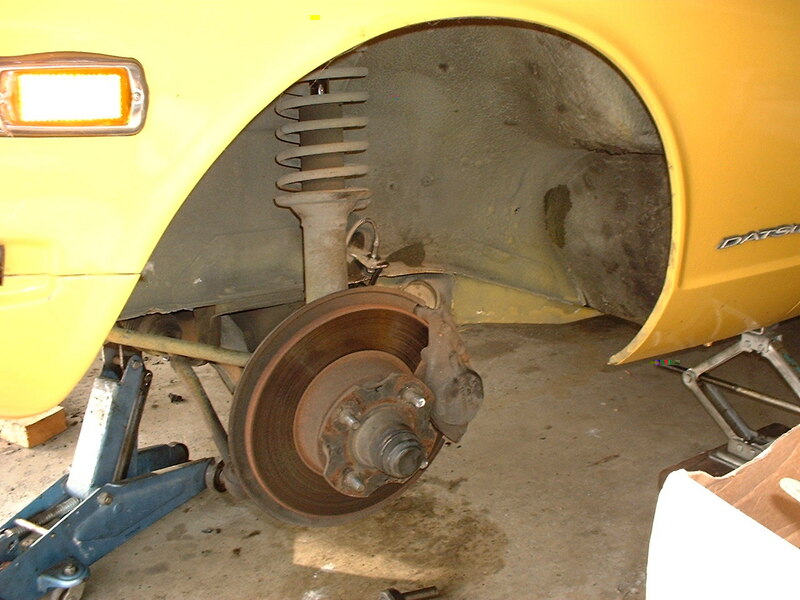 When I first looked at the wheel well I saw this image: As I started cleaning the inner fender well getting ready to repaint and seal the fender well. I find that the doubler had failed and was eaten away from the inside. Leaving a mess that looks like this: I will not repeat the next thoughts that went through my mind. You can fill those in for yourself. After a few minutes and some regrouping I decided to go ahead and remove all the under coating. I got out my rubber gloves paint stripper and putty knife and removed all the undercoating. That exposed more rusty metal which lead to getting out the sand blaster and cleaning the entire wheel well. I then cut the spot welds holding the doubler on: Leaving this damaged area: I cut the damaged area out. Sandblasted and treated the area in the boxed frame with Phosphoric acid. I then cleaned the area with Marine clean and then Metal Ready getting ready to refinish this area after the repair was complete. I then cut a cardboard template out to fit over the cut out area. I then cut a piece of 16 gauge flat sheet steel to match the template approximate size of 8â€� X 16â€�. Fit the first piece to fit against the floor board and then attached a Â½â€� x Â½â€� angle to the new plate following the contour of the floor board. Notching the angle as needed to follow the bends. I matched the height of this piece to match the top of the sheet metal on the other side on the inner fender well to gain maximum strength when I welded the pieces together. Cut another piece of 16 gauge metal 3â€� X 12â€� and bent a Â½â€� lip 90 degrees. Fit it up to the angle along the floor board and against the top flange of the frame rail to replace the original doubler. This doubler I welded solid all the way around. I then slotted the front edge to follow the contour of the wheel well frame bent the pieces to fit the contour. Rechecked the fit and then clamped it into place and welded the built up pieces into place. Suns up I am moving cars to get it right now. I am not worried about putting miles on mine just have to have the time. I drilled the broken bolts out and ground the head on new ones into a "T" shape and cast them back in place with fiberglass resin and fibers. Also built the edge up to match the fender contour with fiber glass. see my pictures for that work. Signs of a bad harness? Looks like a bad ground. I fought a problem like this for over a year and found the return fuel line was plugged. The small line on the right side.